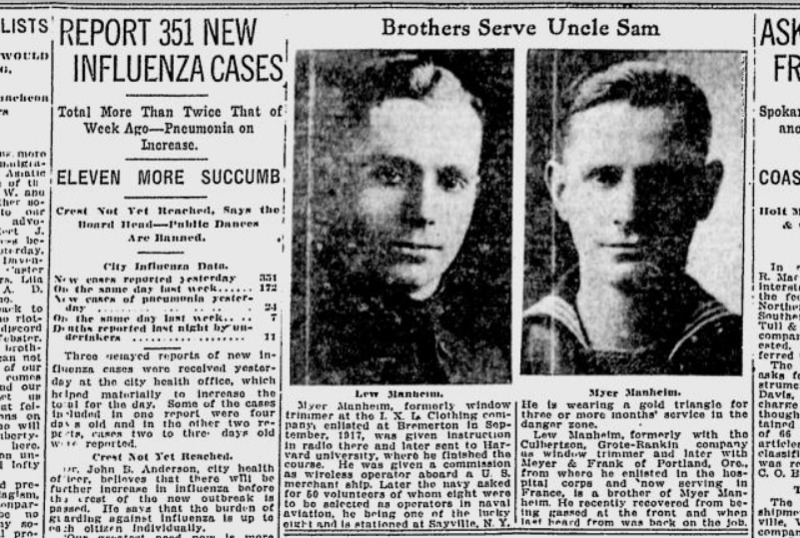 A shocking 351 new cases of the Spanish flu – and 11 deaths – were reported in one day, making it all too clear that the “crest of the new outbreak” had not yet passed. Schools, dances and mass assemblages were already under a ban, and city health officer Dr. J.B. Anderson said he didn’t know if a stricter ban would do much good. A number of citizens had bravely volunteered to wash dishes and do other chores at the city’s emergency influenza hospital. Yet trained nurses were in short supply because of the sheer scope of the outbreak and the fact that many were stricken with the disease. This was not just a local crisis, by any means. An Associated Press story reported that from 300,000 to 350,000 people had died nationwide of the flu and related pneumonia. Dr. Anderson was headed later in the week to Chicago for a national influenza conference, where he hoped to learn more about how to handle the epidemic. He was scheduled to be gone for eight days. From the vaudeville beat: Harvey Allen Ball, known as “The Banjo King,” was arrested in Spokane as a draft deserter.